Welcome to our March 11, 2016 PD Day Homepage. 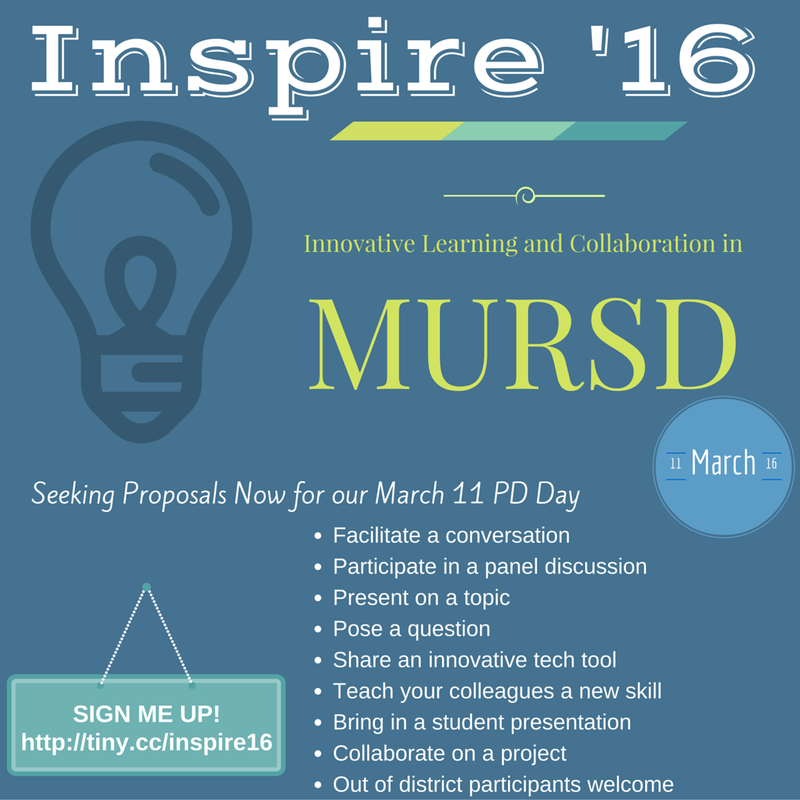 Consider this your one-stop shopping for any links to information about the Inspire '16 PD Day. We are excited to open up our PD day to participants from other districts to collaborate with us on innovative, creative, and inspirational best practices in education. We believe that the best PD is one that allows for both voice and choice for our educators. Please click on the links below to find out more about our day, to submit session proposals, to register and best of all...to be inspired. We are now seeking proposals for the March 11 Inspire '16 professional development day from both in-district and out of district participants. Click on the link above to submit your session idea. Check out our Inspire '16 Update page which will keep you up-to-date with any changes and additions to the day. ​ It will also provide you an overview and goals for the day. for our registration and sign-up process. The schedule will be built as soon as we receive proposals. You can click on the link above to create an account. ​Registrations for sessions will take place after February break. Feature Tour for Attendees from Sched on Vimeo. Evaluations will be posted here for this event by March 11th. The professional development day will be located at Nipmuc Regional High School, 90 Pleasant St. Upton, MA. The link above will bring you to a map of this location. We will be providing lunch to all participants in the cafeteria. We will be offering two separate time slots for lunch, either during Session 3 or during Session 4. Please e-mail Laurie Arcudi at larcudi@mursd.org if you need a gluten free lunch option. Courage is a relative term, and to run can certainly take on several meanings. Having the courage to run can be interpreted in numerous ways. Make no mistake about it; having the courage to run means we are moving. We are either running from something or toward something; and it’s usually both. Having the courage to run means we’ve made a decision, and our decisions are catalysts for great things. Everything that happens in our lives happens first between our ears and then between our hours. Something is going to happen on Friday, March 11, 2016 in the Mendon-Upton Regional School District. Bring your sneakers. We may even run. It's your time to glisten. Why not you? You'll laugh, you'll feel, and most importantly - you'll think. Aaron delivers an authentic message that changes lives and transforms cultures. You'll laugh, you'll feel, and most importantly - you'll think. Aaron delivers an authentic message that changes lives and transforms cultures. Aaron brightens mindsets, builds capacity, and ignites action. His message transcends day-to-day routine and resonates for a lifetime. Your outlook will change immediately. The results are long-lasting and have helped to transform individuals, companies, and school systems alike. Click on the keynote link to learn more about our keynote speaker.